As reported by Business Times on 14/02/12, PETROLIAM Nasional Bhd (Petronas) has made two new big gas discoveries offshore Sarawak. 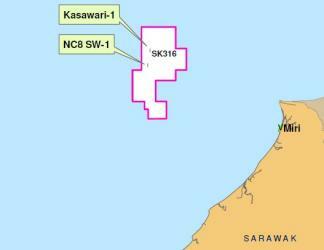 It was found at the Kasawari and NC8SW fields in Block SK316 offshore Sarawak, through exploration wells Kasawari-1 and NC8SW-1. According to Petronas, the Kasawari-1 well was drilled in November last year and gas was found in the carbonate reservoirs. The well, drilled to a depth of 3,196m, penetrated about 1,000m of gas column, making it the longest drilled section of gas column in the country. Preliminary assessments conducted early this month indicated that gas-in-place for the Kasawari field is over five trillion standard cubic feet (TSCF), with estimated recoverable hydrocarbon resource of just over three TSCF. This makes it one of the largest non-associated gas fields in Malaysia. The well-test which was conducted produced 29 million standard cu ft per day of gas. Meanwhile, the NC8SW-1 well, located about 17km south of Kasawari, was drilled in September last year to a total depth of 3,853m. Gas was found in a 440m column in similar carbonate reservoirs. The recoverable resource for the NC8SW field is estimated at over 450 billion standard cu ft. Petronas said the NC8SW-1 well discovered potential oil play which requires further evaluation to determine its commercial viability. The national oil company said Kasawari-1 and NC8SW-1 are the latest wells drilled in Block SK316 and the gas discoveries are a direct result of its strategy to intensify domestic exploration. It has also enhanced the prospect of the gas play in Sarawak. More activities in the area targeting similar objectives are in the pipeline, it added. For 2012, Petronas and its production-sharing contractors are planning to drill 30 exploration wells to further enhance the prospect of Malaysia's basins.